American fashion designers turned textile experts, Esprit offer elegant and luxurious rug designs which complement the interiors of many modern homes. Known as an international fashion brand, Esprit was founded in 1968 in San Francisco. They’ve turned their hand to textiles for the home, utilising their experience in the wider fashion and design industry. Their exclusive home textiles include their elegant and luxurious rug collection. Their ethos is focused around simplicity and pureness and they combine both high quality synthetic and natural fibres in many of their elegant designs. They also have a company-wide commitment to sustainability and bringing the essence of California living to homes around the world. 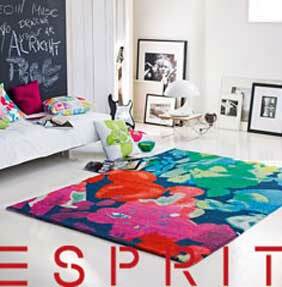 The Esprit rug collection is diverse and well-designed with different styles for different spaces in the home. They produce specific rugs for children, bathrooms, hallways and of course a wide range of designs which could work well in many different spaces in the home. Their collection includes rugs with both deep and flatweave styles, to suit high traffic areas in the home as well as more exclusive spaces.